Despite the lack of international mayoral attendance, Bayview Hunters Point shone last Friday as its Southeast Community College hosted Bridging Social Justice and the Environment: Community Conversations. Part of the United Nations World Environment Day 2005, this event highlighted struggles and victories faced by one of the Bay Area’s most environmentally impacted regions, and allowed attendees the opportunity to hear about experiences and speak about concerns. Panelists included community leaders, local elders, and special guests. Unfortunately, those most apt to address people’s concerns were not there to do so, and it was made clear that international policymakers planned to ignore the environmental degradation of Bayview Hunters Point as San Francisco policymakers have been doing for years. 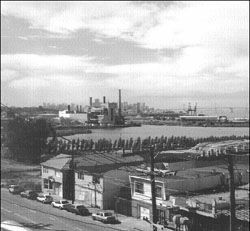 In 2003, Bayview Hunters Point residents and community environmental justice organizations filed complaints with the US Department of Energy, charging the California Independent System Operator and PG&E with violating Title VI of the United States Civil Rights Act of 1964. By applying standards that subject Bayview Hunters Point residents, the majority of who are low-income people of color, to unnecessary levels of fossil fuels, PG&E and California Independent Systems Operator are violating civil rights, the residents and organizations said. Two years later, residents continue to suffer a medical chart’s worth health problems through being exposed to pollution from two of the state’s oldest power plants. This is in addition to the constant bombardment they receive of fumes and gases from sewage treatment, cement factories, a radioactive shipyard, and two highways. “We’ve been the canary in a coalmine for too long,” said Van Jones, founding director of the Ella Baker Center for Human Rights, referring to a subject’s serving as a telltale for change. According to a 2003 study by the nonprofit Greenaction, residents in Southeast San Francisco are hospitalized for cognitive heart failure, hypertension, diabetes, emphysema, and asthma at three times the statewide average. “The city of San Francisco has never made a commitment to the people of Bayview Hunters Point or to their health,” said Dr. Raymond Tompkins, administrative lecturer at San Francisco City College. The rate of breast cancer in African American women under the age of 50 is twice as high there as in the rest of the state, he said. “And men, chemicals do not discriminate. Lena Miller, development director for Hunters Point Family, agreed. “Everyone has their time and now is the time for Bayview Hunters Point.” She should know. She and a number of neighborhood young people, in response to their being subjected to marginal supermarkets with low-quality produce, developed the only urban organic farm in the state. It is managed and implemented by community youth, said Miller who believes that youth development and greening is the same thing. “It gives youth a vision and the vision transforms reality,” she said. Transformation of reality is what residents of Bayview Hunters Point need, Cedric said, referring to the majority of community members who did not attend the event. “They’re so mired by depression that their only thought is of how to relieve it.” Addressing the concerned citizens and activists who did show up, he said, “They’re in a place without hope and we need to bring it back to them.” How do we accomplish that and stop from destroying ourselves? According to Veronica Hunnicutt, dean of the Southeast Campus of City College San Francisco, we get rid of toxic mindsets and focus on peace. For peace is more than an action, she said “Peace is a quality of life.” Let us hope that for the residents of Bayview Hunters Point the peaceful quality of life comes sooner rather than later. After all, it is their time to shine.